Get thee to KScope14 in Seattle! Once again it is that time of year when the who’s-who of Oracle development geekdom gather for their annual festival of education and networking. 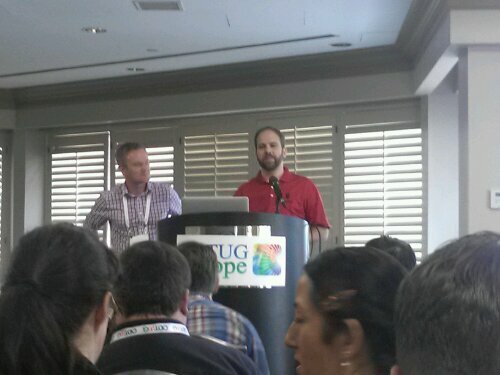 Yes it is time for ODTUG’s annual event KScope14 to be held in Seattle,Washington from June 22nd – 26th. 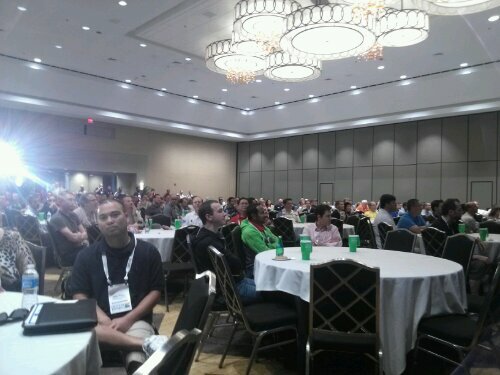 As always this is the not-to-be-missed independent Oracle user conference for users by users. This year includes 52 Oracle ACEs and ACE Directors, plus Oracle Corp Product Managers, and a host of other great speakers. Check out the entire list here. As always there will be ample opportunity to network with the presenters and other attendees including breakfast with the ACEs and the popular Lunch and Learn panel discussions. If you can make it to Seattle early, lend a helping hand and participate in the Annual KScope Community Service Day. This is the only event of its kind where the user community gathers to give back to the host city. This is now an annual tradition for ODTUG going back to helping in New Orleans in the aftermath of Hurricane Katrina. As in past years, I will be giving several presentations myself, and running my now-annual Morning Chi Gung classes for those that want to start the day with this ancient Chinese health practice. I will holding these sessions each morning (Sunday – Thursday) at 7 AM. If you need more convincing, check out ODTUG President Monty’s interview with Oracle Database Insider. Ready now? Okay, go register here and you can still get the early discount rate! Amazing but true – you can now enter a contest to win dinner with ODTUG President Monty Latiolais at ODTUG’s annual conference KScope14. This year KScope will be held in beautiful Seattle, Washington from June 22nd – 26th. Who knows what amazing dinner adventure will be in store for the winner! KScope13 Day Five: C’est Fini! Yes, the last day of the conference arrived. Many folks got a bit of a slow start as they recovered from the prior evenings festivities (but that is true almost any day in the French Quarter!). Morning Chi Gung was smaller but still a respectable turnout of 14 people. Some of my participants had already started their trek home, others just could not quite get up… c’est la vie. 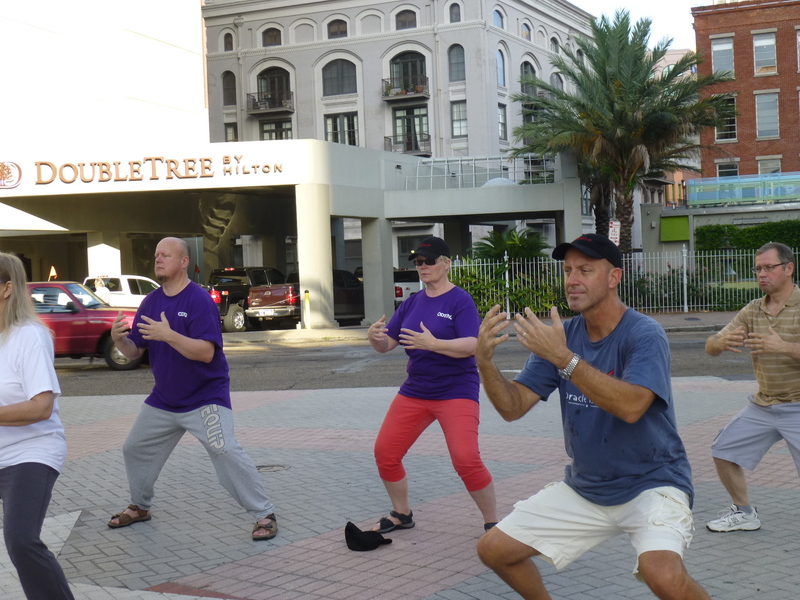 Morning Chi Gung participants practicing a still stance meditation and breathing exercise. My first session on this final day was Charles Elliott from Rittman Mead, discussing how to do Social Network Analysis with Oracle Tools. He discussion centered around using R and a graphing tool called D2 (www.d3js.org). Network analysis of KScope contributors and influencers across two tracks. Charles had mined some data (from twitter I think) and then charted some of the connections to determine who were the major influencers related to KScope13 and several of our tracks. My name is up there, but I am a very small dot. You might be able to see in the picture a pretty big dot which is Gwen Shapira, who was not even at the conference this year! Looks like very cool tech. Not sure where I would use it (yet). One session I was not too happy with was this one. It was titled as an agile implementation success story but it was (IMO) a veiled pitch for a free addin to SQL Developer. 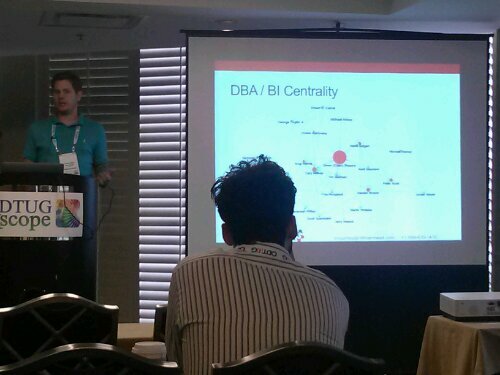 The entire presentation was a statement of issues in trying to do version control of database objects. And they were all legitimate issues. But there was no case study of a specific project and how they tried to solve the problem. The solution was a product from the speaker’s company that they have developed as an add in to SQL Developer to allow you to control database object check in and check out at the database level. Nice idea. Looks like it will work. But, the product is not even available today! It will be release later this summer and is free for up to five users (then I assume it will cost $$). My beef is that this should have been clearly labeled as a vendor presentation not as a “success” story. For my last session I went to Stewart Bryson and Edward Roske’s presentation on Innovation in BI: Oracle Business Intelligence Against Essbase & Relational. This was a great collaborative effort between these two guys who work for companies that might be considered competitors. I am pretty sure this is a KScope first (in many ways). 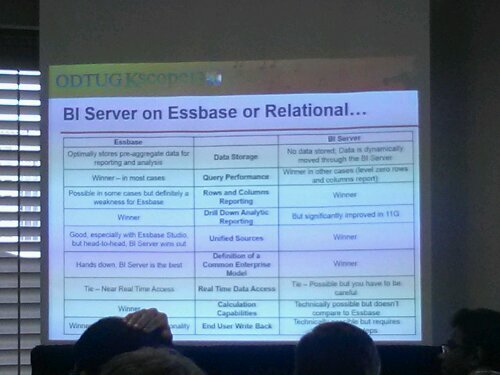 A KScope 1st: Stewart Bryson and Edward Roske do a joint presentation on using OBIEE against both Essbase and a relation data warehouse at the same time. In the end, after some demonstrations of how to do this, they guys left us with a really nice comparison chart on when to use which tool and its relative effectiveness in solving specific problems. Edward and Stewart came up with this nice chart trying to compare the two technologies on a number of features and functions. A relatively new KScope tradition is to hold a final closing general session. Here we say farewell to the event and the city with some slides and humorous videos from the week. We also get to learn who the top five speakers were for the event (as ranked by session evaluations) and who the speaker of the year winner is. This year the Best Speaker Award went to Edward (don’t call me Ed!) Roske from InterRel. There was also an award for the best Kscope Ambassador (the one who helped with the most sessions). This went to Mark Becerra. As a final note we got a great little video welcoming KScope14 to Seattle. The even bigger news was that we already have sponsors for the 2014 event! Platinum, gold, and sliver level sponsors have already signed! Plus a boat load of exhibitors. We must be doing something right that they have secured their spot a year in advance. The website for Kscope14 is up and running. You can register, submit an abstract, and make your hotel reservation for next year. I can’t end this series without at least one picture of the great food here in New Orleans. I did eat well! 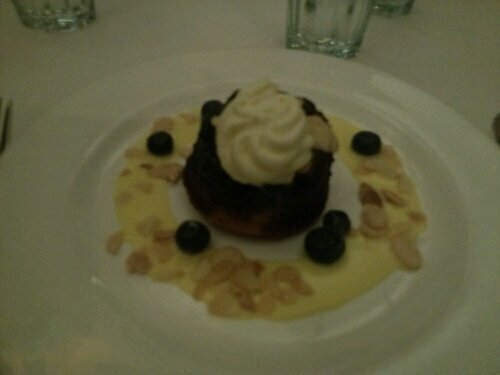 Ending the conference on a high note with blueberry upside down cake at celebrity chef Emeril Lagasse’s restaurant NOLA in the French Quarter. See you in Seattle (if not sooner)!